This is a brief overview of Revenge Tragedies. The essay was prepared by Solomon Romney for a notional theater performing The Changeling. Humanity is plagued by envy. It is an outgrowth of man’s innate desire to excel above all others, including other humans; and is an aspect of the strong survival instinct that has brought man to its place of dominance. As long as man strives against man for advancement and the acquisition of property and power, they will descend to a level where eventually they will do anything to achieve that goal. An individual can reach that level, when someone forces them to act because through the deprivation of something or someone very dear to them, With the development of a sense of justice, namely through the writing of religious texts (and later social consciousness) a certain amount of credibility was lent to these acts of vengeance. 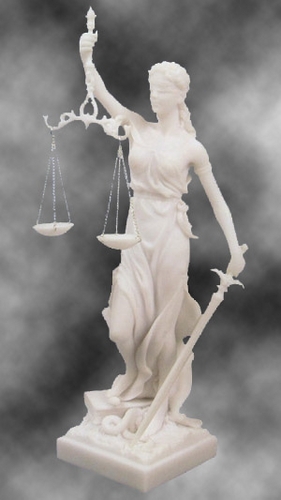 The certainty of serving a higher form of justice, of knowing that acts of violence and destruction are condoned because one is righting a wrong carries great appeal. Tales of such exploits fill European myths and legends, the stories of the House of Atreus or Hercules in Greek myth, or Robin Hood taking vengeance on the evil Sheriff of Nottingham, Western Culture is obsessed with these discussions of justice. These stories question the social views of right and wrong, and the theatre of the English Renaissance embraced them. Nearly every dramatist of note in the period wrote a tragedy with revenge qualities in it. Taking model from the Greeks, these Elizabethan and Stuart playwrights developed this sub-genre, but with so many different writers using this style in such a relatively short amount of time it is difficult to determine the specifics of this rather loosely gathered group of plays. What makes a revenge tragedy? How does decide what belongs and what does not? Because of the diversity of the writers variations will occur, the aim is not to set a rock solid definition that must be adhered to. It is the goal of this paper to address these issues and lay the broadest general guidelines that will encompass as many of the works as possible. The Elizabethans studied classical and neo-classical tragedies, but when it came to writing their own works they varied widely from the models. Classical tragedy was described by Aristotle in The Poetics, studied by the Italians and came, by way of the French, to the English. Tragedy always dealt with the highest levels of society, the nobility, the royalty, heroes, and gods. The protagonist had to possess a fatal flaw that would lead to their ultimate downfall. There had to be a moment of recognition in which the hero realizes that they are the agent of their own doom followed immediately by a reversal of fortunes and the fulfillment of that doom. Someone had to die. This all had to occur in one location, during one continuous period of time, and with only one plot (the Italian neo-classicists later called these the Unities). English Renaissance dramatists adhered to the Aristotelian form except for the Unities, which they discarded. Ben Johnson is the notable exception as he made a point of following the Unities as much as possible. English drama of the period is characterized by its episodic structure, its long, irregular stretches of time between scenes, and its many subplots. The presence of the supernatural is another major element of drama from this time. The episodic structure arose out of the mansion staging system of the medieval theatre of miracle and morality pageants. They added to this hybrid form a strong sense of individual justice carried over from ancient pagan traditions and a long history of blood feuds. The Anglo-Saxon mindset of personal justice was so deeply ingrained that even after the more than 500 years since the Norman Conquest it was still a major element of English life. By the end of Elizabeth’s reign, acts of private vengeance had become so prolific that severe laws had to be passed, which the courts enforced harshly, in order to safeguard the stability of the society. The only form of action allowed the individual was immediate, reactive reprisal at the moment of injury, which was considered felony manslaughter with a high chance of a royal pardon. The introduction of continental justice systems and political philosophies, Machiavelli’s The Prince, for example, only gave the already violent medieval English society more refined tools to carry out their acts of personal vengeance. Political and religious wrangling, poaching, subtle deaths (poisoning and such) and open dueling had supplanted the more straightforward forms of earlier justice such as eye-for-an-eye and murder as a crime against the closest family member. Such ‘civil warfare’ was rampant at the time that these playwrights were working, and as the very aristocratic patrons of many of the companies were the ones carrying out such acts of reprisal, the subject lent itself easily to the stage. Bower cites envy as the greatest Elizabethan vice and arguable one of the most powerful for inciting revenge (22). It was a topic dear to every English heart and as such found massive popular acclaim; Elizabethans were very interested in analyzing their criminal passions (Bower 20) and the stage gave them just such an opportunity. Revenge was a mainstay of the Renaissance theatre. Revenge tragedies can be divided into two major categories and a third smaller one based on the protagonist and the motivation, Personal Revenges, Property Revenges, and Reverse Revenges. These revenges, with the exception of Johnson’s work, follow all of the classical rules of tragedy baring the Unities. People must die, and, as the Elizabethans and Jacobeans did not have the Greek aversion to violence on stage, many people do in these plays, usually including the avenger (except in reverse Revenges). Vengeance leads to more vengeance until all parties that are justified in their revenge are either satisfied, or more often, dead. These plays tend to have high body counts. Supernatural elements, such as ghosts, often appear, but they are by no means vital to a revenge tragedy. Disguises, plays-within-plays, and other forms of deception exist in nearly every revenge tragedy; the protagonist must be clever to catch the murderer in such a way as to make murdering them just. So the question becomes what makes revenge tragedies different from other tragedies that possess elements of vengeance? Answer: revenge. Revenge must be the central motivator of the protagonist (again, except in a Reverse Revenge); it must be premeditated and become their sole, near obsessive, concern. A play in which the protagonist commits a vengeful act that is not directly involved with the central concern of the play, a sub-plot or an act of immediate, reactive reprisal against injury, especially when it occurs late in the action, is not a revenge tragedy. For example, Romeo avenges the death of Mercutio at the hands of Tibalt, an act of reprisal, but revenge is not Romeo’s central motivation. A play in which the motivation and the planning of the vengeful act begin early and remain central throughout the work is a revenge tragedy. Hamlet’s plotting of the downfall of Claudius is the most oft used example. It is important to keep in mind that the avenging individual must be free of malice or culpability for the original inciting action, in this case, generally murder. This is vital to their acceptance as a just and justified agent of revenge. Personal Revenges are the most common of the three categories and the best known. The protagonist, innocent of any malicious action, suffers a dear personal loss, a father as in Hamlet, or a son as in The Spanish Tragedy. That loss is usually motivated by envy of some kind, either property, position, or power. Both the murdered family member and the avenging relative, our protagonist, must be innocent in the case of that original, envious murder. The audience is completely sympathetic to the protagonist because their case is entire just; there is no guilt or shame attached to their act of vengeance. The murderer is someone usually quite close to them, someone they trust, often a member of their family or a very dear friend. In the pursuit of their vengeance the main character must be destroyed, either killed or damaged to the point that they are as good as dead. When this happens, the audience, seeing justice fulfilled is also reminded that vengeance is nothing but destructive. Justice is served while personal revenge is put down as ultimately too costly. The playwrights, knowing full well how their patronage worked, made a point at the end of always reinforcing the existing social order. In this way the lust for personal justice and the needs for social stability are both served. The second category, Property Revenges, are still fairly common, but lack the definitive sense of unquestionable justness that makes Personal Revenges so effective. The protagonist, generally rather ruthless and guilty of goading the opposition, is deprived of their property early on and spends the rest of the play regaining their wealth and taking vengeance on those who took their possessions. The length to which the protagonist goes in order to enact his plans is often beyond the justifiable limits and thus it is harder for the audience to be sympathetic towards them when they ultimately cause their own downfall. Property can be regained, people cannot be brought back from the dead, and therefore, the acts justified for the latter are too extreme for the former. This category also reinforces the effects of going too far, but that is not its primary goal. Often times, Property Revenges work to reveal social injustice, the mistreating of a certain group of people, or a legal or cultural policy that is unfair or unjust. Marlowe’s The Jew of Malta is a prime example of going too far and revealing social injustice. What is lacking is the truly personal connection to the crime and thus the acts of vengeance. People still die, but it is a means, not an end as in a Personal Revenge. 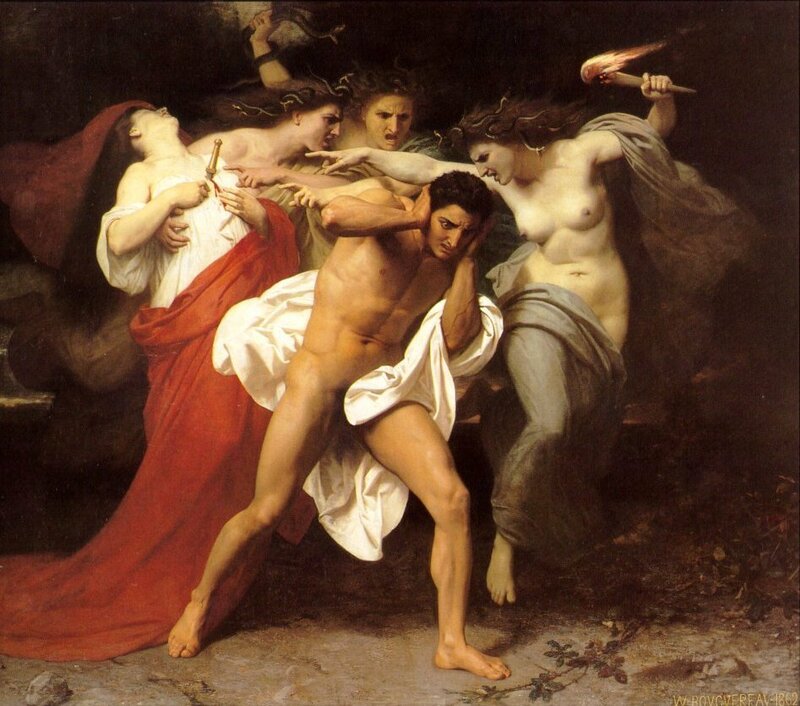 The Furies, spirits of Vengeance, pursue Orestes for the murder of his Mother. Reverse Revenges are a unique, relatively rare form of revenge tragedy. In these plays the protagonist is not the individual enacting the revenge, but is the person suffering it. We find an anti-hero as protagonist; the play is reversed, seen from the perspective of the villain rather than from the eyes of the injured. In these plays, the avenger does not die, but is vindicated in their acts of justice. They show restraint, duty, and deference to the law, all things that the usual protagonists of revenge tragedy fail to do. The avenger lacks the fatal flaw, but the protagonist always suffers from an overweening sense of pride, ambition, and usually a healthy dose of paranoia. Macbeth is a prime example. Shift the focus of the story to MacDuff or Malcolm, son of the slain king Duncan, and the play fits the model of a Personal Revenge Tragedy (lacking the destruction of the avenger). It is because the protagonist is the villain, Macbeth, that the tragedy is reversed. These plays, while perhaps the most difficult to construct, show the sides of good and evil clearly while giving the inquisitive Elizabethan mind the opportunity to really explore the criminal mind. The social structure is reinforced here as in the other two categories. The questions of justice and revenge have been fundamental to western culture throughout its history and remain just as important today. Elizabethan and Jacobean revenge tragedies provide a well-defined view of justice while allowing for questions about the criminal mind and the justice system to be put forth safely. The themes and situations if not the exact stories remain with us to this day. Crime dramas, modern stories of vengeance, and tales of struggle against injustice are all outgrowths of this brief but explosive period of drama. Further research into the effects of these plays on following literary works and modern society would be needed to truly trace the influence of these monumental works. Also, more in-depth studies of Reverse Revenges may yield surprising results about how society then and now sympathizes with the criminal mind.